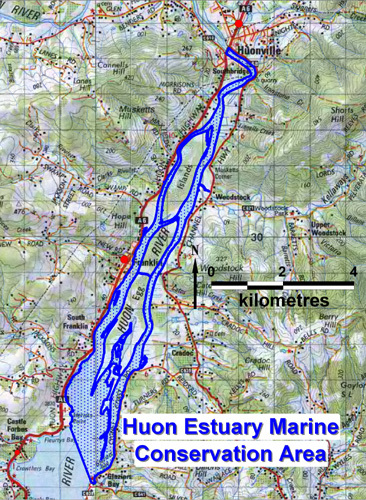 The Huon Estuary Marine Conservation Area encompasses 694.2 hectares of the Huon River between the Huonville bridge in the north and near Glaziers Bay in the south. The reserve is a near pristine estuary habitat of high ecological importance. The area plays an important role in estuarine processes including nutrient cycling, hydrodynamic and sedimentary processes. The area contains important migration habitat for the vulnerable Australian grayling (Prototroctes maraena), and also provides a feeding, breeding and rest area for whitebait and the Australian grayling, and a nursery and refuge area for sharks. A tidal delta of geoconservation significance known as the 'Egg Islands Tidal Delta' covers the majority of the reserve area.